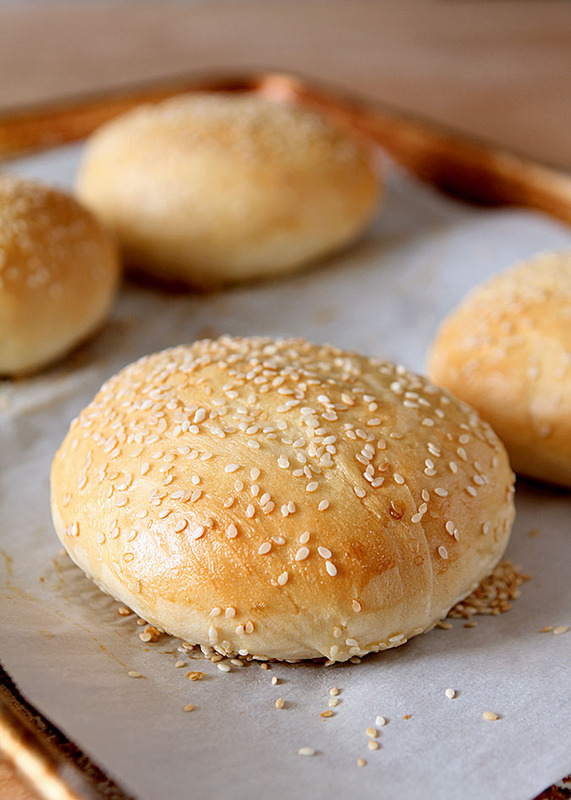 If you want an extra special burger, than make your own Homemade Hamburger Buns with Sesame Seeds. No harder than making a loaf of bread and SO good! This post will be short and sweet. Short because it took me two days of trial and error to get the perfect bun and sweet because now that I’ve made them…I think EVERYONE should make their own; they are amazing! 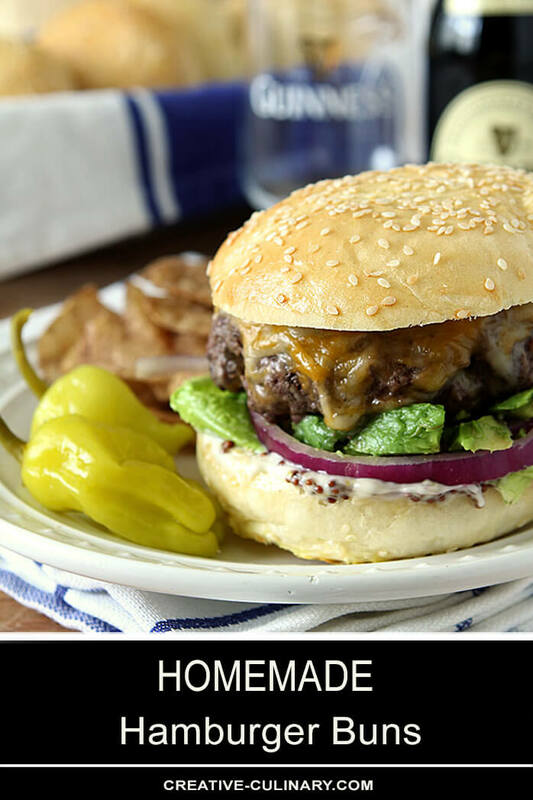 May is #BurgerMonth all across the land and I’m participating with a group of bloggers to provide one or more recipes every day of the month for burgers we love. Even before my eventful visit to a new Smashburger that opened near me two weeks ago, I had planned something with jalapeno but that visit changed everything. They were featuring the Spicy Cowboy Burger and I had to try it. I love plain old regular Smashburgers but this one? You’ll see. I do know it was spicy. I can’t confirm if it was cowboy but I see that. Beef, barbecue sauce, cheese, bacon, jalapeno and onion rings…giddyup! I had my ingredients all ready to go but something was just awry. While I had decided to add a bit of sesame seeds to the mix because I love them, the buns I bought did not improve overnight like I had hoped. They were still wrinkled like a grizzled old man (or cowboy?) and while fine to eat a burger with they just were not cutting it for photographing one. Let’s make some I said!! So I did a search and found some that I thought looked nice and away I went. Eight bazillion hours later (OK, really only about 4), after all the proofing and rising and hitting and proofing again, I was able to bake them. They were GORGEOUS. And heavy. More biscuit quality than burger bun quality. I tried to convince myself but I’ve learned one thing…if I have to try and convince myself there is simply no getting beyond the fact that I didn’t love them. I had a concern as I was making them that seems to have been reasonable…why wasn’t the liquid warmed to insure the yeast reacted? Hmm??? WHY??? So next time I smartened up. I had a packet of Red Star Yeast so I went to their website for a recipe and lo and behold they had one for Hamburger Buns. Funny how that works huh? Except for a final egg wash and some sesame seeds they were perfect. Well, almost. I did take issue with their directions; I thought their times for proofing should have included some time estimates…I took a qualified guess and was close but a newbie would have been in trouble. I left them a comment suggesting the inclusion of a range and guess what? They wrote me today and agreed and have since changed the recipe to include a time range for proofing (the time it takes to rise). LOVE that about a company that actually listens, don’t you? These were easy as long as you’ll be around the house for a couple of hours. Bread baking is not hard but it does require some time and I make sure I can dedicate an afternoon to being home; other than that? There is only about 15 minutes of work. The homemade hamburger buns are so good I could toast them and just add butter and jam for breakfast; who cares if beef was intended? Look for my Smashburger Spicy Cowboy Burger this coming Monday too; it is a real winner! Combine yeast, 1 cup of the flour, salt and sugar. In a microwave-safe bowl/cup, heat water and milk to 120° to 130°F. Combine the dry mixture with the milk, water and oil in a mixing bowl with paddle or beaters and beat for 4 minutes on medium speed. Add egg; beat 1 minute. Gradually add the remaining flour and knead with dough hook(s) 5 to 7 minutes until smooth and elastic. Place dough in lightly oiled bowl and turn to grease top. Cover; let rise until dough has doubled. Check at 60 minutes and continue checking every 30 minutes until doubled. For me it took almost 2 hours but I'm at altitude so nothing is the same! Turn dough onto lightly floured surface; punch down to remove air bubbles. Divide into 8 equal pieces. Shape each piece into a smooth ball. Place on 2 large greased baking pans or use parchment paper. Flatten each ball to a 4-inch diameter, allowing one inch between buns. Cover; let rise until indentation remains after touching, about 20-30 minutes. For glaze, whisk together egg and water and brush on rolls. Sprinkle with sesame seeds (optional). Prep time does not include the time for the bread to rise; plan on up to 2 hours for that portion of the recipe. Thank you so much for letting Red Star Yeast know times or even estimated times need to be clearly spelled out. I just started making bread and so many recipes assume everyone knows the basics of bread making. I know nothing about making bread, but thanks to people like you and You Tube I am learning!! I’ve been baking bread off and on for 25 years and I still want a time range. I want to be able to walk away while it’s proofing and not have to watch it like a boiling pot! Glad it helps you LeAnn…bread is such fun to make and homemade is the best. Good luck! I used vegetable oil Melissa although you could use other oils if you prefer something else. Beautiful buns! 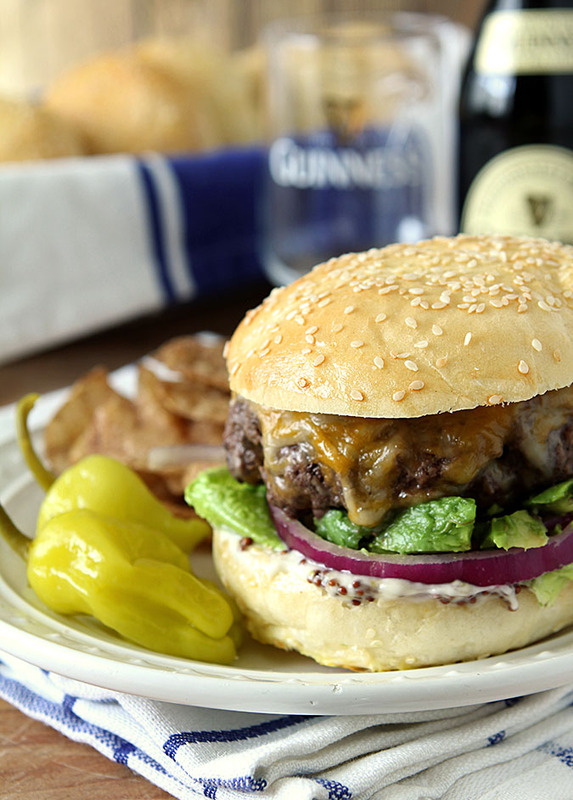 Nothing compares to homemade burgers. Thanks Rosa, I just love them! 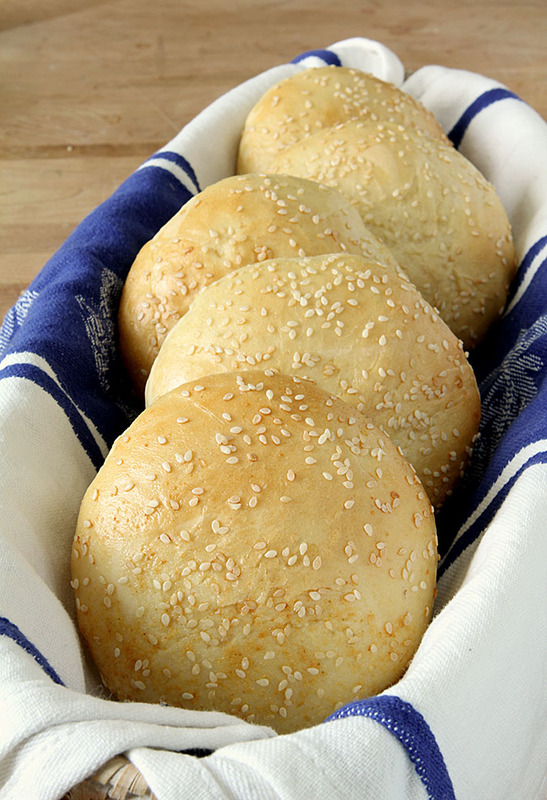 We make our own hamburger buns sometimes — one with a fair amount of whole wheat in it. Really wondering, though, if the traditional hamburger bun is better tasting. Anyway, yours look perfect! My kind of bun — thanks.